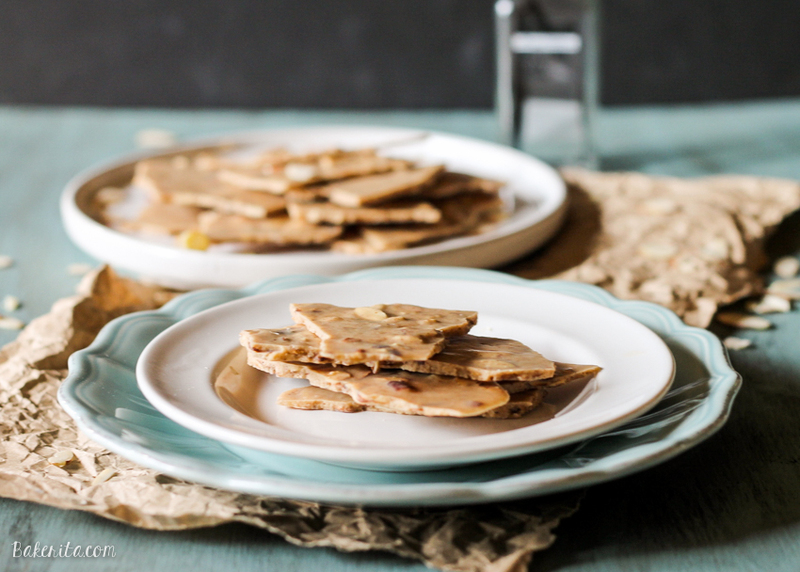 This Vanilla Bean Crunch Almond Butter Bark takes about 5 minutes with just 5 ingredients. It’s crunchy and creamy, and sure to satisfy sugar cravings. 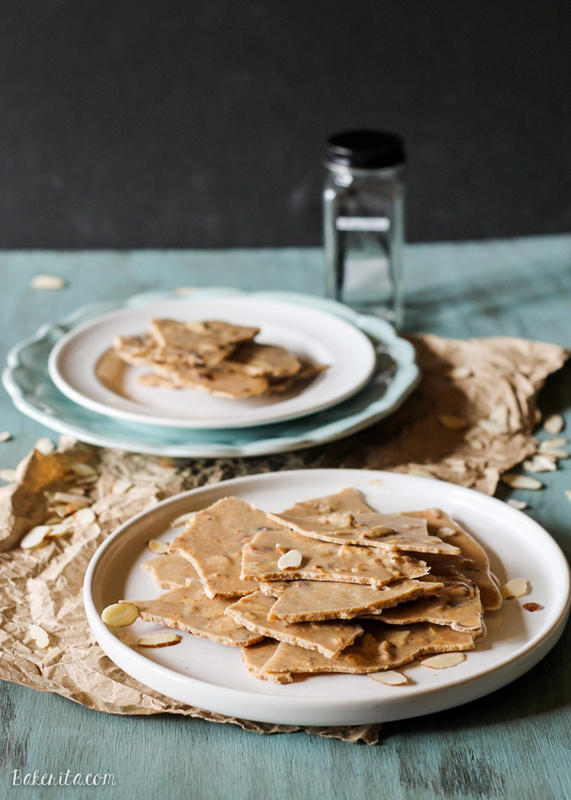 It tastes like candy, but it’s Paleo, sugar free, vegan, keto & gluten-free! T-2 days until my last semester of college starts. This isn’t real. We’re not going to talk about it. Instead, we’re going to talk about how you can prep this almond butter bark in literally, about 5 minutes, less if you’re speedy. Oh, and don’t turn on your oven, no cooking is required (except to melt the coconut oil – which is microwave friendly). 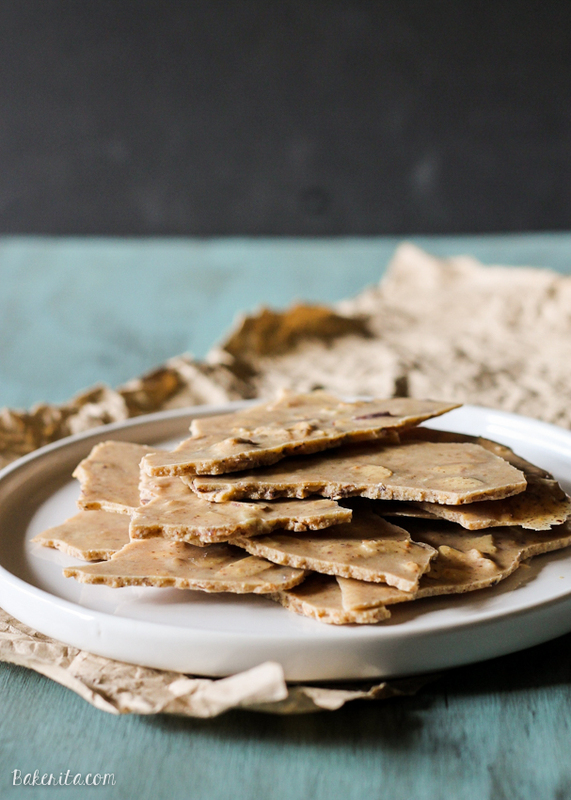 But first, let’s talk about what almond butter bark is, because that’s what’s awesome. So often…”bark” is an excuse for chocolate loaded to be more sugary garnishes and candies. And bark is awesome, and we all love getting it for Christmas, but…it’s probably not the best thing for us to be eating all of the time, right? THIS bark, however, is two things we can totally eat all the time: almond butter and coconut oil. That’s it. In the right proportions, the coconut oil helps solidify the almond butter to create a creamy, snap-able bark that’s totally addicting. Of course, on the base of those two ingredients, the options are endless, but I opted for simple and it turned out incredibly. The vanilla bean paste adds a beautiful, soft vanilla flavor that’s definitely noticeable, and the toasted almonds add the best nuttiness and crunch. The salt ties it all together, but you can skip it if you’re using salted almond butter – mine was unsalted. I love that this is only 5 ingredients (barely, does salt even count? ), sooo quick and easy, and 100% free of sugar and gluten and all that stuff. It’s 100% Paleo, too. But seriously, I’m just mentioning that, because everyone will like this recipe, not just people with dietary restrictions and allergies. You can play around so much here too. I’m dying to try making a mocha version! You could also switch out the almond butter to peanut butter or any other of your favorite nut butters, even sunflower seed butter to keep it nut free. I’d love to hear how you like it, so leave me a comment down below, and enjoy! In a medium bowl, combine coconut oil and almond butter. If coconut oil is solid, melt mixture together in the microwave for about 15-30 seconds until the coconut oil is melted. Whisk to combine. Add in the vanilla bean (or paste or extract) and toasted almonds, stir. Pour mixture onto the prepared baking sheet. Sprinkle with sea salt (I used Maldon). Place in the freezer for 30 minutes, or until the bark is hard and can be snapped apart. Snap into pieces, and store in the refrigerator. OMG! This recipe, Rachel!! Almond butter bark that can be made in just a few minutes with healthy ingredients… SO trying this! Good luck on your last semester of college! I hope it all goes well. And you don’t have to drop 1 million dollars on books! I can’t believe that this is so easy! This would be a great thing to bring to a party. Everyone would think you slaved over it, but really it took just 10 minutes. This looks divine and I love the simplicity! It’s summer here where I live so no bake recipes have been my salvation recently! Pinning! GAH! Feed me this bark every day all day! 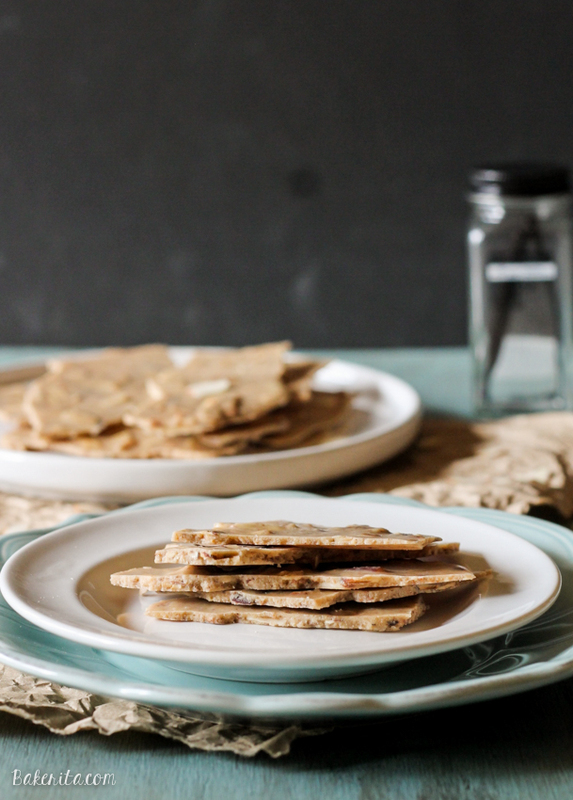 I have taken a serious obsession with all things almond butter…and then with coconut? You’ll LOVE this – I’m totally addicted! Thanks for the pin, lovely! This almond butter bark sounds DELICIOUS! I love how simple and easy it is! i will certainly be making this very soon :) :) Pinned! Thanks so much for the pin, Ceara! I LOVE how simple this bark is. I would eat way too much of it. Pinned! Five minutes to make this masterpiece? Sign me up! I love this idea! Who isn’t a huge bark fan, of course, but I do have trouble with how much sugar and stuff is in the “traditional” version. I’ll take a sugar-free, paleo version any day! This bark looks divine, Rachel! Love the vanilla bean flavour with the almond butter- AMAZING! These look absolutely amazing! I’ve never seen a similar recipe before so I definitely have to try this one. I love how versatile and simple it is. The pictures look stunning as well. Yup – should work fine, as long as your peanut butter isn’t too oily. Enjoy! This looks and sounds really yummy. However, just thought you should know that vanilla bean paste is a mix of vanilla and sugar so this would not be sugar free if that is what you are using. Hi Bakerita! Almond butter bark is one of the delicious recipe. I love almond butter cake. Thanks for sharing. can you store this at room temp? or will it melt? It won’t melt at cooler temperatures, but if you’re in a warmer climate, I’d recommend keeping it in the fridge.